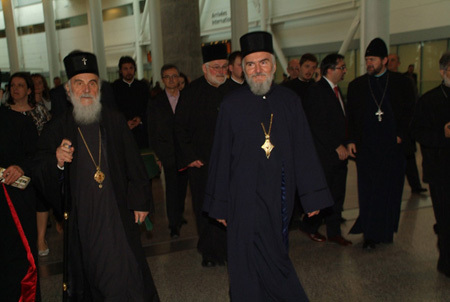 His Holiness was welcomed at the Toronto airport by hundreds of faithful led by the priests of Ontario, led by His Grace Bishop Georgije, as well as representatives of the Consulate of Republic of Serbia in Toronto. Bishop Georgije greeted His Holiness at the Diocesan Center, at the Holy Transfiguration Monastery in Milton, Ontario, following the Doxology at the Holy Three Hierarchs Chapel. Wishing him a warm welcome he asked Patriarch to bestow the blessings of St. Sava upon the clergy, monastics and faithful people of the Diocese of Canada. Following these warm words the Patriarch of Serbia gave his blessings upon all those present, thanking them for their love and warm welcome which they showed him. "I thank the Lord that we will during these Paschal days serve Divine Liturgies in the churches of the Diocese of Canada. We are one people, here and there, even those we are physically separated, we are spiritually together and one, and only in that way, with the help of the Lord and St. Sava, we will resolve the problems we have both there and here," said the Patriarch. After the Doxology, dinner was served at the monastery guest house during which time Bishop Georgije, the clergy and members of the Diocesan council informed their dear guest of all the newest accomplishments in the diocese. During his visit the Patriarch will take part in the celebration of the 25th anniversary of the Diocesan periodical "Istocnik", on Bright Friday, at Holy Transfiguration Monastery, and he will bless the frecoes in the largest Serbian church in Canada, All Serbian Saints Church in Mississauga, on the west side of Toronto, on Sunday, April 22. In addition, services and visits are planned for Hamilton, Kichener and Waterloo, cities with large Serbian populations.